Research on the audience showed that they relied heavily on the advice of friends and word of mouth, so a campaign was built to encourage people to share their authentic experiences about #LifeinCbus. Traditional advertising launched the #LifeinCbus hashtag, and the website lifeincbus.com aggregated organic content from Instagram and Twitter as well as local media outlets. The campaign took a risk putting the messaging in the hands of millennials living and working in Columbus. But it paid off when Columbus millennials began sharing authentic messages highlighting what they loved about living and working in Central Ohio. The campaign could then amplify those messages with paid advertising. Understanding that long commute times and high cost of living were pain points for young transitionals in the target areas of Chicago and Washington, D.C., the campaign developed a video and highlighting messages like “Where Cost of Living is More Living Than Cost” and “Where Standing Out Never Means Standing Alone.” The #LifeinCbus campaign found messages that resonated by understanding its target audience – where those people want to get information, what sources they trust and what matters to them. Read an Experience Columbus blog post about this campaign. 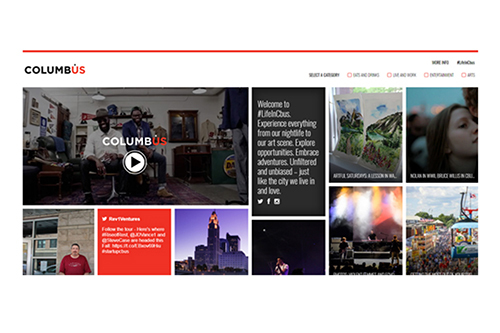 The #LifeinCbus website aggregates content posted to the hashtag on social media.